**BETTY ALERT** Betty, don't read this blog until you've received a package in the mail! Go aWAY from the page, Betty!! Various items cut from china, both new and old. Won't this make a pretty necklace? I just love this rooster china pattern; here she's made it into a bird feeder. But I couldn't stop there. Also got two recipe holders, both with pretty rural scenes, one being Currier & Ives, three magnets with pretty little scenes on them, and an Occupied Japan creamer made into a night light, that is absolutely perfect in my beachy bathroom that has vintage tin sand pails and things like that. Oh, and I did make a purchase in another booth: the necklace thingie on the left that contains a little strip of lace that has Pennsylvania tulips on it. Couldn't leave a Pennsylvania tulip behind. This week-end was also BOM day at LQS, so got the blocks done. With the fabrics from the main BOM, I did another block out of my Maggie Malone block book and did the usual 12" block using a Westminster fabric, doing another Maggie Malone block. For the applique, I added one black-eyed susan and a somewhat alarming cat. We now have eight blocks done for each of our whatever-we-decided-to-do, and about this time, I start wishing that I could assemble them. I've been using the background fabric for the 12" blocks for almost a year now, so it practically qualifies as using up one's stash :-). I just hope the stash inventory holds out until all the blocks are done. I just guessed at the amount at the outset. 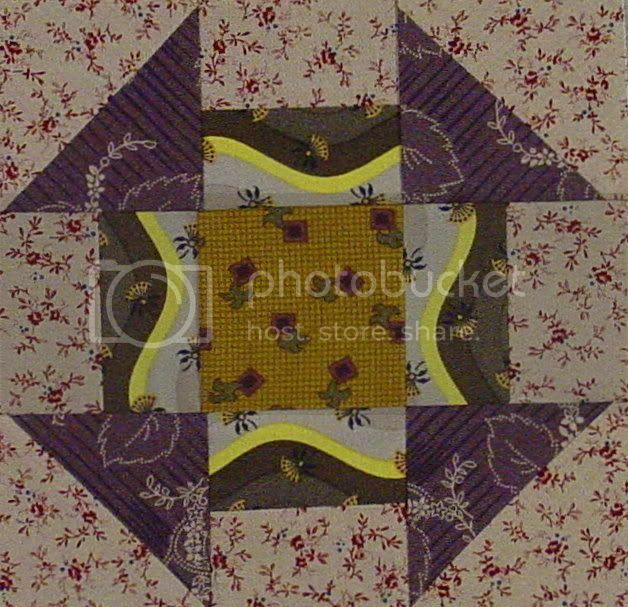 Thank you, peewee, for the link to the quilt origami site (previous post's comments)! How clever! the bird feeder is adorable and love both the recipe holders and the night light. I think that cat block is sweet. Goodness I miss that fair. It's one of the best in Georgia. Is it still as crowded though? What great ways to use china pieces! I have a box of broken china that I keep saying I will use for a mosaic. I think it has at least two mover's stickers on it...beats the amount of time your Lillebet was on the design wall! Browsing your site again; been so busy trying to get together the silent auction for Ava Grace that I haven't had time to even read any blogs. Love the pics of your finds at Stone Mtn. Also, have a few books on fabric origami; have never been able to accomplish anything but a wrinkle . . . Happy to help with the link. Hey, I just saw your "to do grid". What a great idea! I have a set of those chicken dishes! What a unique bird feeder she made with these pieces.